Welcome to Shiner Law Group, where we treat every client like they are a part of our family. Give us a call today, let’s see how our team of professionals can help you and your family! Shiner Law Group is a law firm comprised of Florida licensed attorneys who represent injured people and those who have suffered losses as a result of someone else’s carelessness or actions. Injuries resulting from an accident will impact all areas of a person’s life. The attorneys at our Firm have years of experience and knowledge in helping accident victims recover much needed financial compensation. If you suffer from an injury that was caused by someone else’s negligence then you need attorneys that focus on helping people recover. Our award-winning personal injury law firm has been successfully fighting on the behalf of Floridians who have been injured in damaging circumstances. All accident victims deserve to have their rights upheld and be fairly compensated when injured. At Shiner Law Group we believe that you should be able to live your life uninterrupted. Let our attorneys fight for you! Through the years Shiner Law Group has continued to grow and expand reaching, serving, and helping everyday people throughout Florida. Because we care about people, families, and our communities we strive each and every day to help the injured from being taken advantage of. As a matter of fact, our lawyers and staff will make working with our Firm easy and, since our law practice covers the state of Florida, we can meet our clients in one of our several offices to better serve you. In essence, we are the lawyers with offices near you. We work for you, so you can work on you. We are dedicated to providing each and every client with a hands-on and personalized approach. Our approach to your case allows us to ensure every person receives the greatest representation and outcome possible for each case. Our law firm believes in open, honest, and fair communication with a strong and respectful representation focused on your best interest. Our lawyers understand the necessity for individual needs to develop a comprehensive strategy guaranteeing the best outcome for any case. Our designations, awards and affiliated organizations speak to our professionalism and track record. So, if you need legal help now, call our Firm for a free consultation. It’s simple: the consultation is free and we only get paid if we win your case. Your focus should be on getting better, not fighting to get compensation for injuries. For this, we offer services on a contingency-fee basis which cost you nothing up front. We only get paid if and when we settle your case. CLICK FOR A FREE CASE EVALUATION! We strive to go above and beyond to reach the satisfaction of each and every client. The positive feedback from our clients over the years speaks to how committed we are to putting quality over quantity. We encourage you to read our client testimonials from previous satisfied clients. It is important that we do our best to make you happy. Although you can never guarantee an outcome, we will make sure that every client is informed about the issues in their case. I highly recommend Shiner law group for personal injury. It’s hard to find a business that represents the “why” of what they do and this particular law group represents just that. They were never anything short of extraordinary. My attorney, Ronnie, always went above and beyond for my case from checking on me to just see how I was doing after my accident to working hard representing me to get the best possible results for my case. 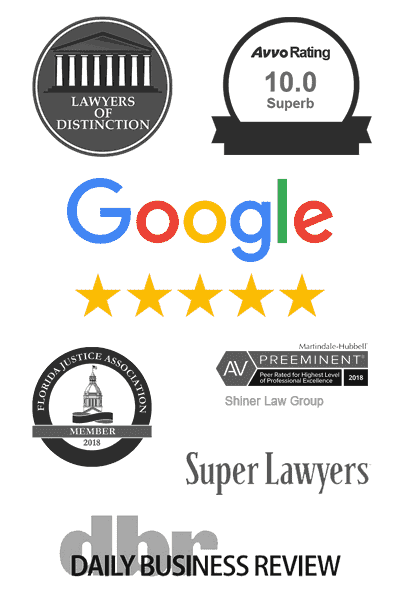 Shiner law group is genuine, intelligent, reliable and professional. They work hard for you and the results show it. I have to say that, even though I had to deal with a car accident which ended with having to have spinal fusion and realignment, I had the pleasure of working with Shiner Law Group. I had two goals with Shiner, to be out of pain and to have my medical bills paid. Donna, Brian, and Danielle made this all possible for me. They were very attentive to my needs and questions and were the absolute kindest people to work with. I highly recommend Shiner Law Group!